Awe striking imagery, original compositions and breath-taking movement sequences all play a part in this absurd yet conversational piece. 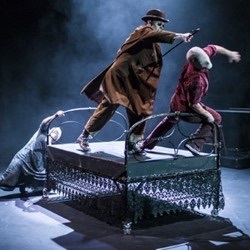 Theatre Re present Blinds Man’s Song a physical theatre performance, incorporating elements of Brecht, often denoting an essence of the incredulous and impossible. This wonderfully balanced yet whole hearted production enchants and engages, embodying every fragment of one’s imagination. This production embodies a heart of the fantastical, alluding to the character of the Blind Man, two masked performers, one piano, one violin, a high-tech sound system and one very malleable bed. Theatre Re, a London- based international ensemble have a reputation for creating vibrant and emotional work, working with an edge of mime, theatre and movement which are all strikingly evident within their current production, Blind Man’s Song. This striking piece of theatre is set within the King Dome at the Pleasance Dome, Venue 23. A black box provides the perfect canvas for this striking piece of visual art. Blind Man’s Song is an exploration of the senses, analysing how often the dark can reveal a multitude of worlds, creation, relationships and stories. This production offers the opportunity to see blindness in an unusual light, exploring the endless infinity of possibilities and imagination. As a theatrical experience it not only conjures up fantasy, it places you within that world, enhanced by the original music, absurd story and authentic movement. This physical theatre production is filled with laughter, excitement and curiosity all original but inspired by a multitude of theatrical genres and practitioners. This production’s scaffolding is its music both composed and performed by Alex Judd who plays the role of the Blind Man. Within this production The Blind Man is performed with such passion that you cannot help feeling utterly engaged by both the music and Alex’s characterisation. The music highlights the action of the piece providing the stimulus for the other two characters. The story of the piece explores a multitude of themes including love, passion, loss and happiness. Throughout the piece we see a relationship both ignite and grow. This is explored by two masked characters who denote the Blind Man’s imagination. These two characters are cleverly choreographed inheriting an essence of absurdity, confusion and intrigue. As an audience member I believe this production is interpretative but one could assume that the masks embody the supernatural, magical and dreamlike quality that imagination often stimulates.